The 1920s was a time when little things were somewhat important to the wealthy and here is something that never fails to impress. The little flags are all hallmarked sterling and the celluloid inserts slide right into the flags. Some have no words printed so that one could write their own. There are six little flags and lots of extras in the bottom row. Imagine marking the sandwiches with these miniature flags. 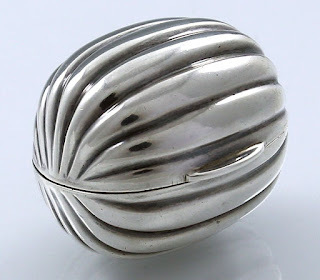 Even automobiles has sterling silver posy holders. On a visit to the Henry Ford Museum in Dearborn I once saw J P Morgan's Rolls on display and remember thinking that if you filled the engine with oil and started it it would probably purr like a cat. Quality is something that can never be overlooked but people need to be aware of what is quality. 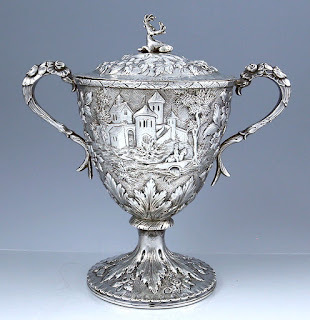 It's always a good idea to look at antique silver and see how well it is put together. There is an old saying that things can look good from far but can be far from good when approached closely. 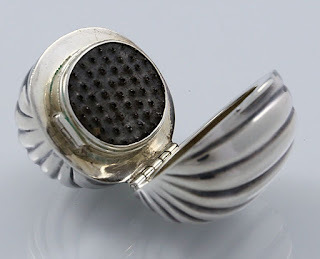 One good thing about working with an experienced dealer is that experienced experts can identify techniques that are a sign of quality. This is what I look for when scanning something that I have not seen before. It tells me how many hours were put into a piece and I use this to assign value. 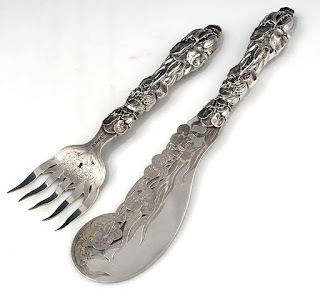 This two piece English antique silver fish serving set has the date of 1851. 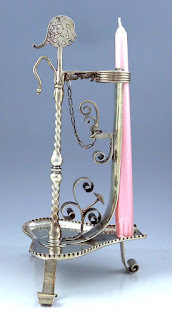 The maker was Hilliard and Thomason. 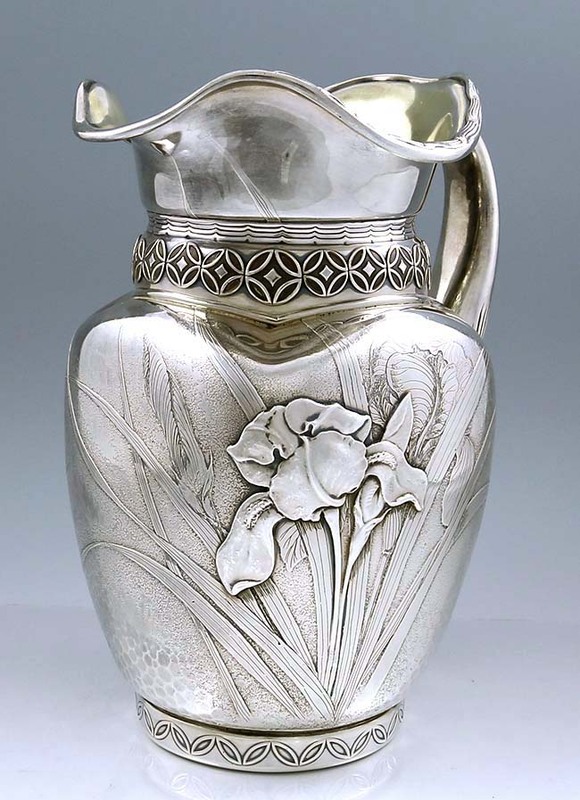 The handle and silver blades have engraved and chased water lilies. 1851 was the year of the Great Exhibition at Crystal Palace, the first of the great expositions that became the place for the world to meet and exchange ideas. 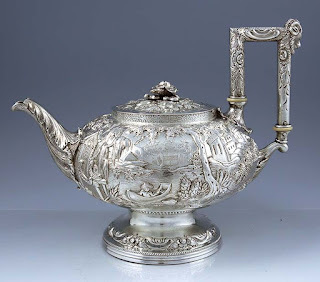 It was the brainchild of the Prince Consort, Albert husband of Queen Victoria. 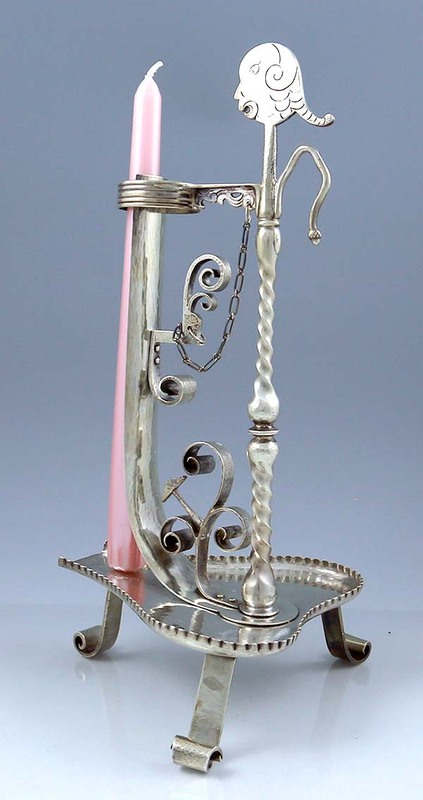 One of the great showpieces of the first exposition was the display of exotic flora and I think these inspired designs like this. 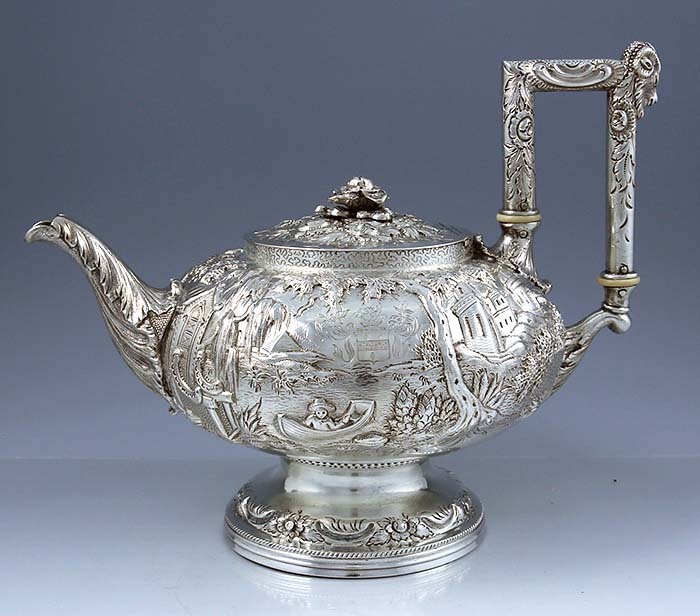 It has become an iconic piece of Victoriana and quite often comes in the original fitted case of a retailer. 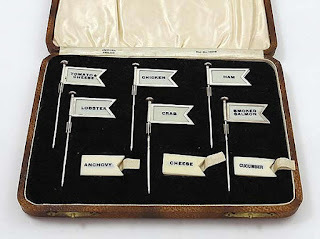 Thus particular set is in pristine condition. The crystal palace was all glass and steel and it had a problem. Birds got in and could not get out. The story goes that Queen Victoria and Albert were troubled and in a conversation brought up the subject with Arthur the Duke of Wellington because they could not shoot the birds for fear of breaking the glass. The Iron Duke responded by telling the Prince Consort to put some birds of prey in that could be recalled after killing the birds. Success! 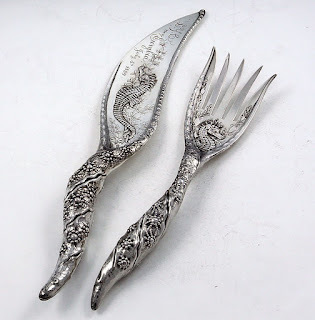 This amazing antique sterling fish set would probably date about 1890 and has what is known as pearling which is a chasing of small dots or bubbles from inside creating a sort of nautical or marine effect. 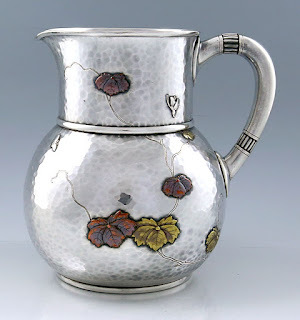 Under the direction of Charles Osborne Whiting used acid etching and applied sea horses to create unique pieces in the Fantasy pattern. 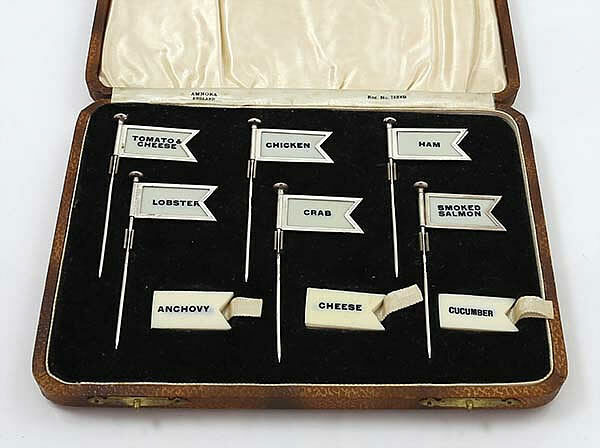 This particular set was either special ordered or purchased as a presentation for a yacht owner and most likely used on board the vessel. 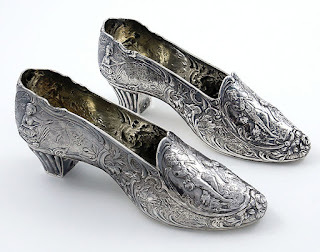 The gilded age was a period of extreme opulence. Another piece of the Fantasy pattern by Whiting. Notice the acid etched seaweed on the plate at the center. This rare and important inkwell has the same pearling as Whiting pieces. Probably the result of Charles Osborne moving back and forth between the two companies. One has to remember that Samuel Kirk was chasing away in his workshop long before Gorham and Tiffany were making silver. 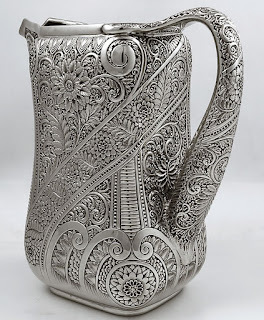 Consequently we should show Kirk respect for the fact that they were a well organized American silver manufacturer in Baltimore and because they consistently produced some of the best silver hollowware in the United States. What really gets people excited in the Kirk landscape series and if you examine the landscape pieces you will notice that some of the best chasing was done later rather than earlier. In fact the chasing of the 1900s to 1920s is really fantastic down to the detail of birds flying in the background to the rod in a fisherman's hand. 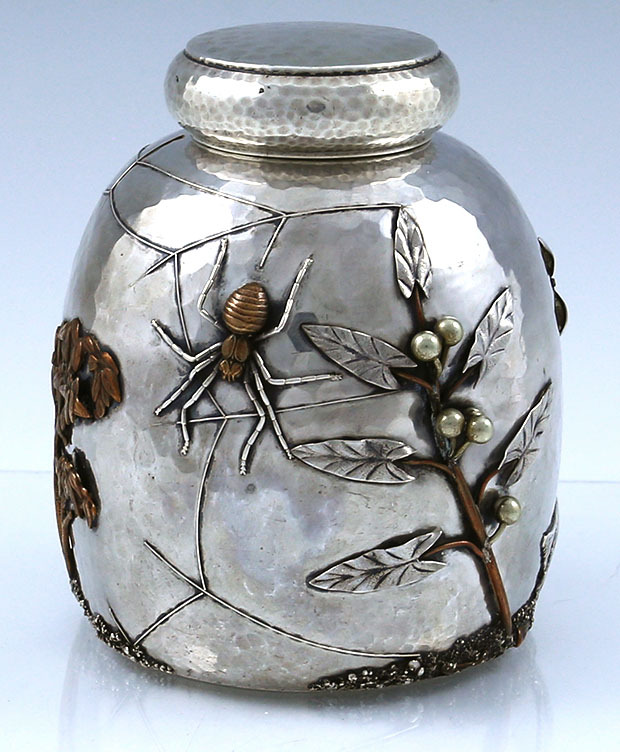 Here is a Kirk 11 ounce landscape covered sugar with a stag finial on the lid. 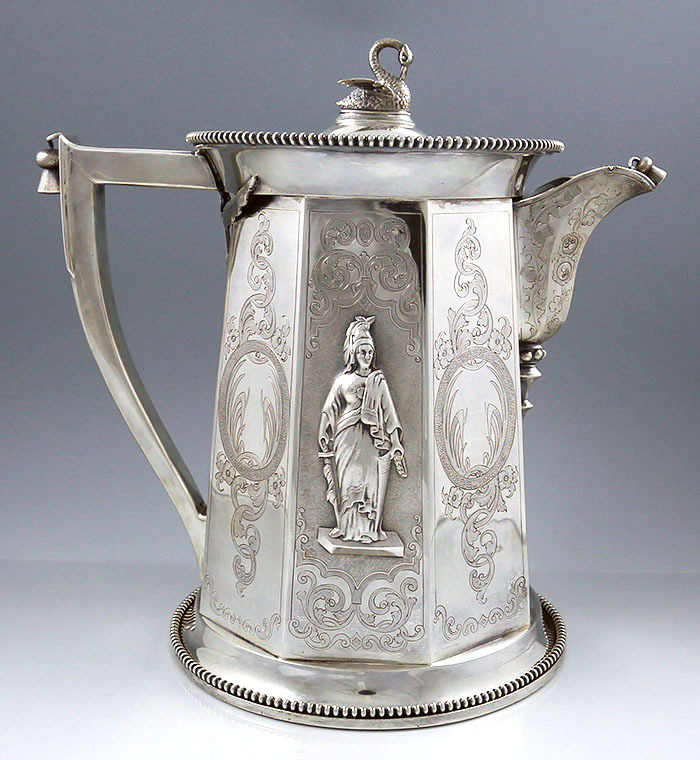 Both the lid and the urn have a French touch mark indicating that it had been either sold in France or imported into France. 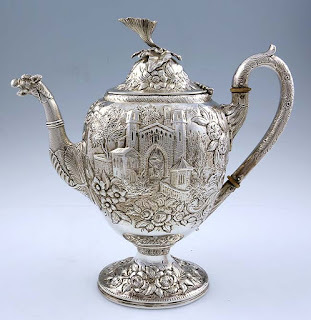 Here is a Kirk teapot with a cast lion finial and large floral finial. The shape is somewhat traditional and the landscape features large important looking buildings. 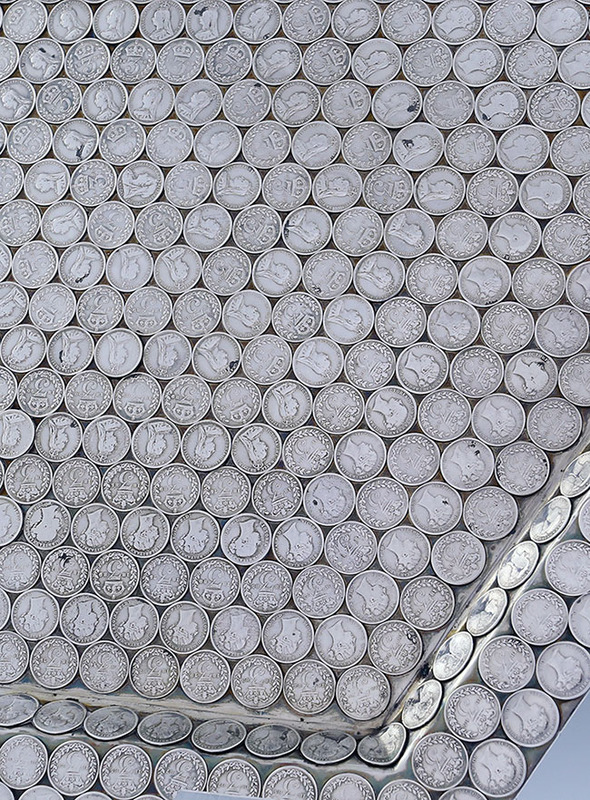 Most of these pieces are well made with considerable weights. One of Edward Moore's two big passions at Tiffany & Company was the Saracenic designs which incorporated Islamic influence into the objects. One of the plants that he liked to use was the Sumak plant. Here are some of the pieces we have found recently. 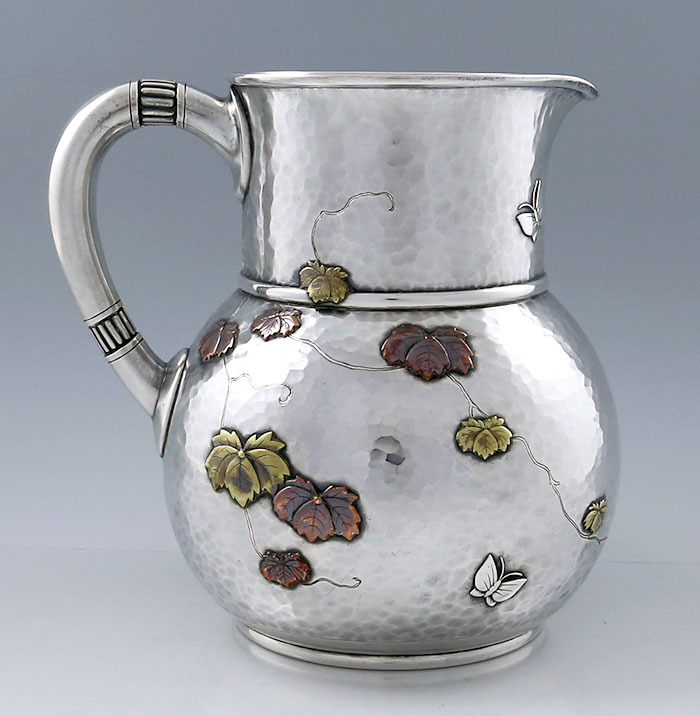 The first item is a cylindrical spot hammered pitcher with Sumak plants highlighted with acid etched leaves to give extra dimension against the hammering. 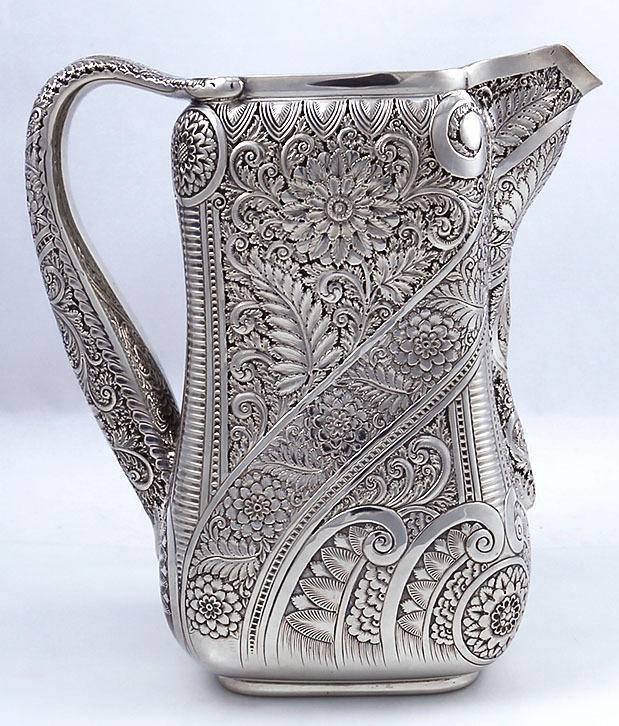 You could have found this exact form of pitcher decorated with Japanese influenced designs or Saracenic designs. 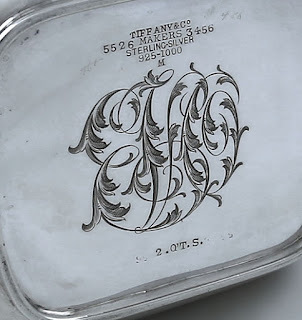 In the late 1800s Edward Moore at Tiffany & Company produced a line of Japanese influenced hollow ware and flatware at the same time as Tiffany's Saracenic line of wares. The attention to detail and the quality was so remarkable that it left a legacy that sets it apart from other American manufacturers. 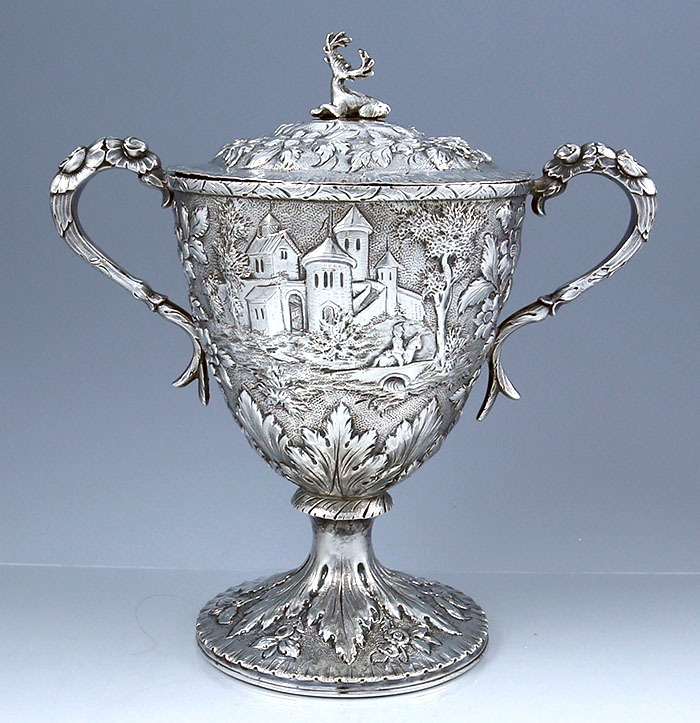 I once asked a collector why he was so fascinated with these pieces of Japanese influenced silver that were executed according to strictly controlled guidelines in drawings with numbers that dictated the very size of the faceting of the spot hammering and he answered that he liked the idea of an American who might well have been chewing tobacco in the studio making these pieces that frightened the Japanese with the level of sophistication and purity. Thirty five years ago I opened my first catalog from Christies as newcomer and could not believe my luck that I had found my passion. Nowhere is the world can one find this quality and uniqueness. 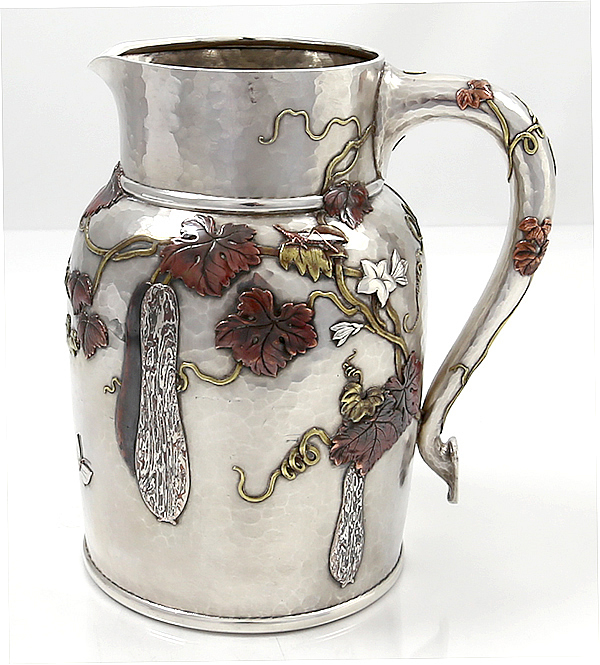 The pitcher photographed here as applied brass and copper oak leaves joined by engraved tendrils. 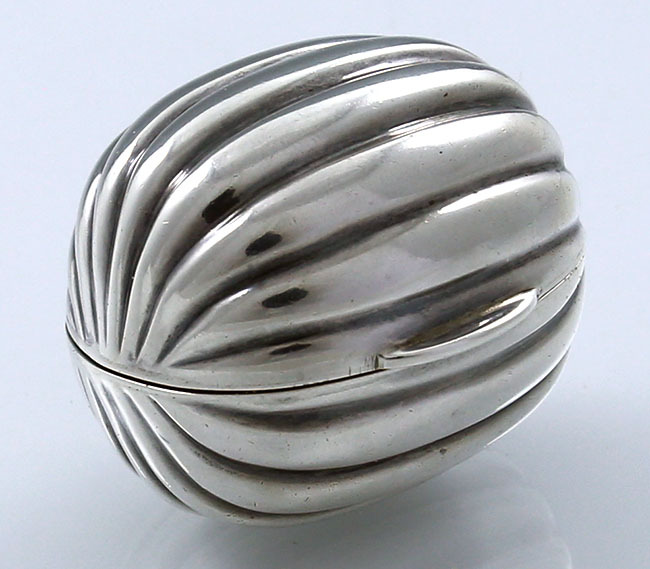 The surface retains a textured satin finish applied at the factory in the 1880s and has not been polished. This is seldom the case. Tiffany made two different sizes of these pitchers, the larger size is 8" tall and the smaller 7 1/4". 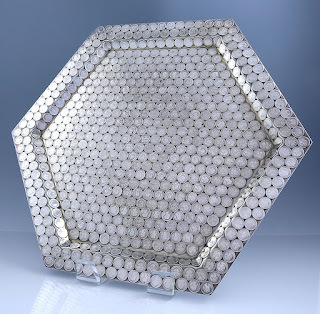 An unusual English silver hexagonal tray came up in the United Kingdom with hundreds of applied three pence silver coins from the Victorian era. 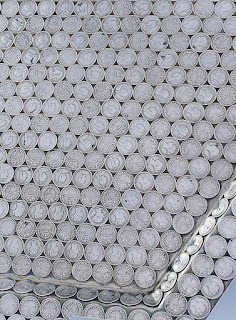 Some of the coins have a young head of Queen Victoria, and others have a older Jubilee head of the Queen with her small diamond crown that she had made for herself later in life. 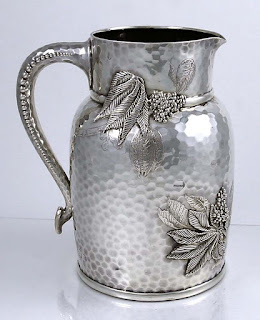 The use of coins in silver can be found all over the work from the Shreve hand hammered silver of San Francisco to the early French silver wine tasters. 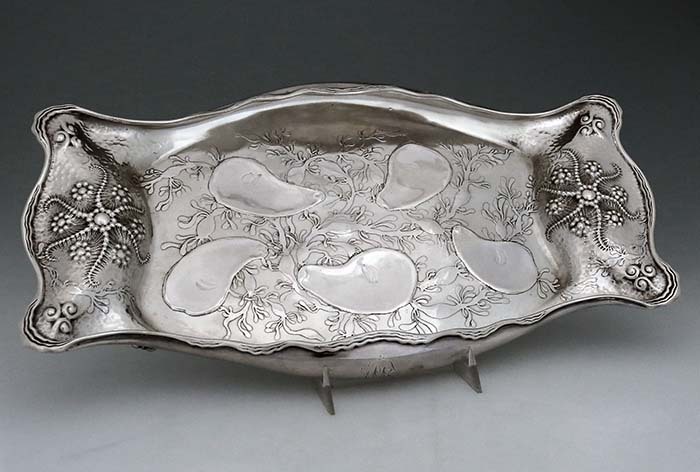 This tray however makes quite a splash and is big enough to put a tea set on. 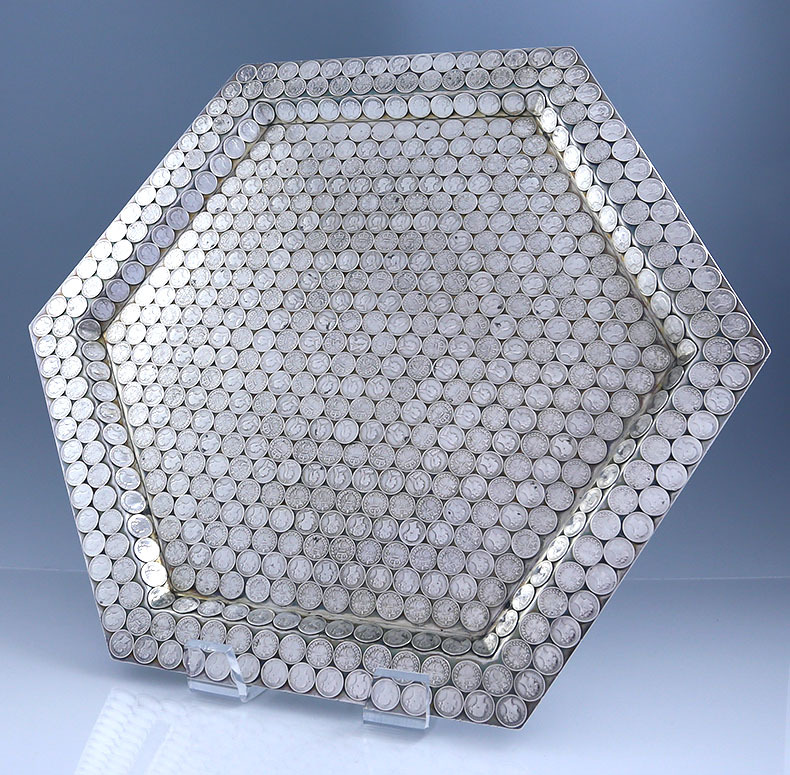 Below see the pictures of the hexagonal English silver tray by Martin and Hall with a detailed photo of the coins applied. 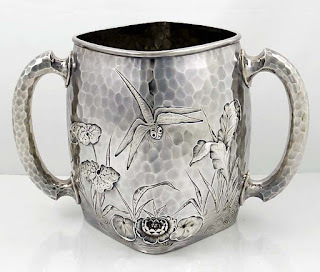 This rare sterling spot hammered antique tea caddy was made by the Gorham Company in about 1880 but was never marked. 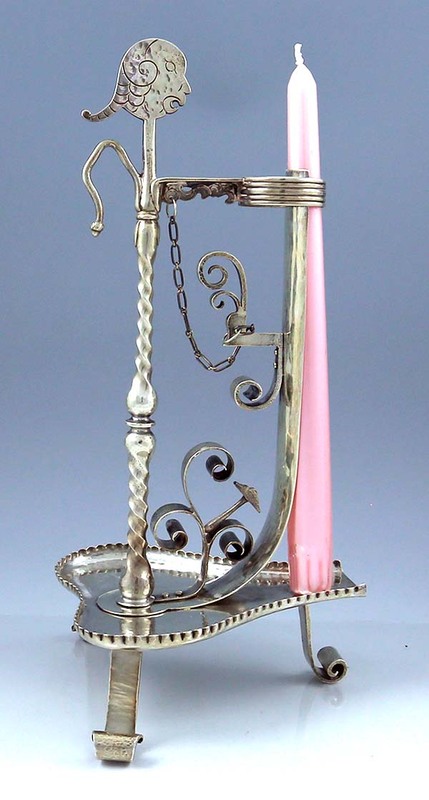 It has a monogram on the base. The detail is quite amazing with applied silver and copper the highlight of which is a large applied spider with copper body. 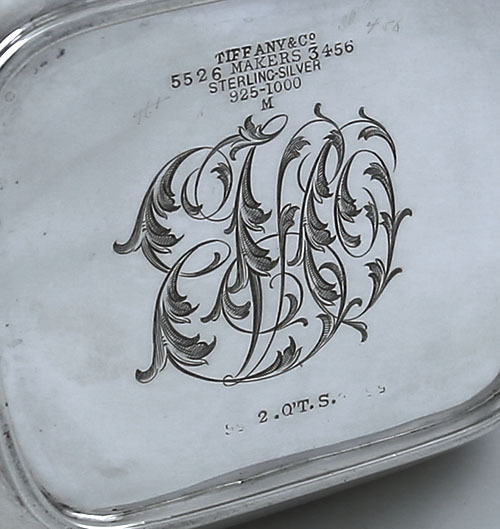 Surprisingly manufacturers omitted their marking quite often for different reasons. One reason was that the retailers liked to put their marks on the pieces and claim credit for the items. 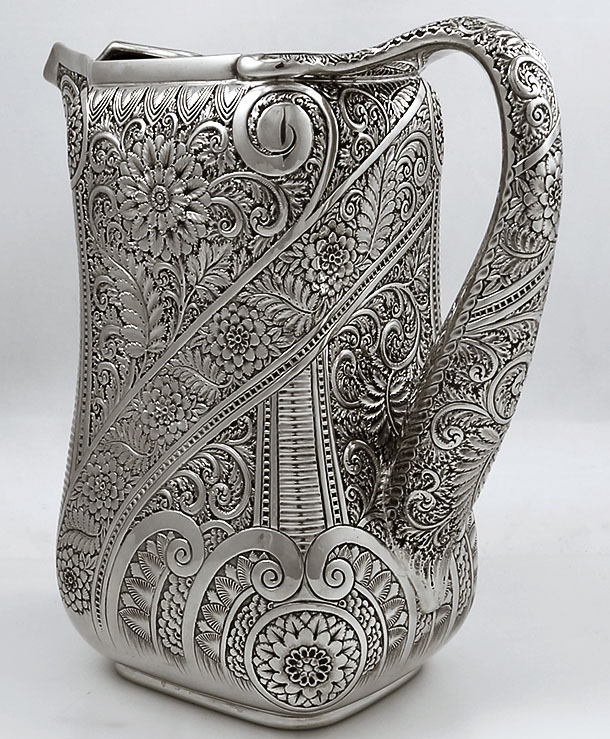 This most amazing 100 troy ounce ice water pitcher just recently came onto the market after being in a collection for a few decades. We just acquired it. 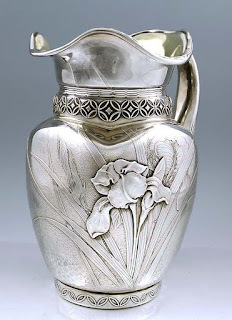 It was presented to Andrew Carnegie in 1865 by the workers of the Pittsburgh Division of the Pennsylvania Railroad where he worked as a clerk before he made his fortune. Andrew Carnegie was a Scot and became one of the most significant figures of the gilded age in the United States. 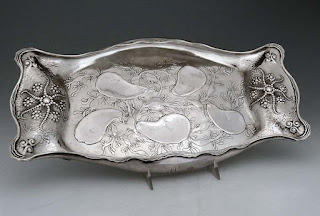 From a silver collector's point of view I find it interesting that the order for this presentation was given to Philadelphia silversmith Peter Krider, who manufactured fine quality silver hollow ware early on together with George Sharp. Nice to know they kept the business in their State of Pennsylvania. Since Mr Carnegie was not a large individual one can try to imagine him lifting the piece while it was filled with ice water. Every last detail in the manufacture was carefully implemented from the hollow cavity beneath the jug for insulating the cold to a hinged hanging flap to seal the spout from the interior. The incorporation of cast and applied thistles needs no explanation since he was a Scot and I think that the figure applied to the side is that of Liberty. The pitcher has been very well looked after and has a wonderful color and patina. The engraving is also quite crisp and clean. We are back after a long absence and ready to talk about our special items of American antique sterling silver that we have acquired. We hope you will find the articles informative and useful.